﻿﻿﻿Standby everyone...another weather update from me! It has been raining cats and dogs for the past couple of days here in the UK - So when I saw this flash of colour on this beautiful Zara bag (above) it felt like the sun had come out! What better way to instill the summer feeling than to wear popping bright coloured accessories?! My stylish colleague (below) always has fabulous bags from Zara and lovely scarves etc. (Aren't we all Zara junkies??!...). 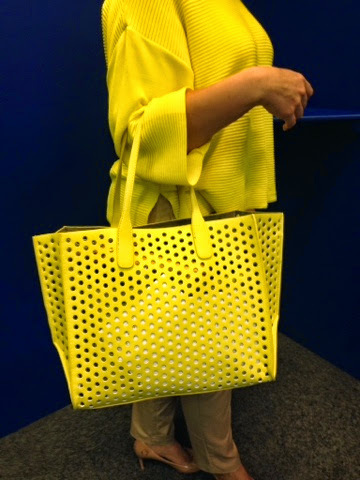 This bright yellow large tote/shopper bag, really lifts the mood and would put a smile on anyones face during a grey day....I just had to snap it for the blog! This bag also comes in White and Dark Brown - I love the detailing on it and it is so eye-catching. You're sure to get admiring stares and comments with this bag! Zara are great for their designer inspired accessories and clothes. 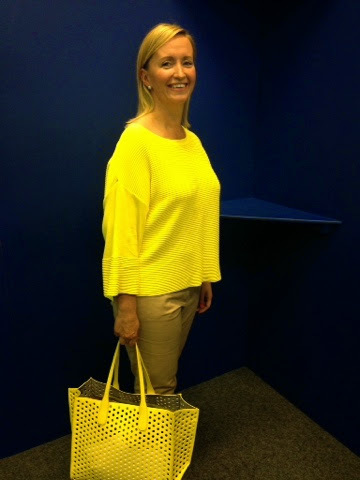 This canary yellow jumper (above) was also purchased in Zara and even better news is that it is now in their sale! - Bargain! (It also comes in white). I have been wearing bright colours all week in the hope that the sun will come out and oblige!